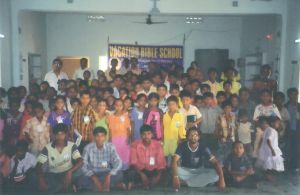 Inty writes "We are conducting Vacation Bible School in different centers in rural villages. 1500 Hindu and Muslim Children are attending." Photo shows students and teachers from one of the villages.